A fuel cell is a device that creates electricity from a fuel by an electrochemical process. In this sense it functions like an battery. The difference between a fuel cell and a battery is that whereas a battery is a closed system, i.e., it has a limited amount of fuel to convert, a fuel cell is an open system, i.e., fuel is continuously fed into the system from an external source. Like a battery, a fuel cell uses an electrolyte plus two electrodes, the anode and the cathode, to chemically convert a fuel to electricity. The process begins with a fuel coming in contact with the anode. The anode has a catalyst that oxidizes the fuel, splitting it into positively charged ions and negatively charged electrons. After the split, the positive ions pass through the electrolyte to the cathode. The electrons cannot pass through the electrolyte, and must move to the cathode through a wire, which creates DC current electricity that can power a device such as a motor. When the ions and electrons reach the cathode a catalyst and an oxidant reunite them in a reduction process. This results in a waste byproduct that always includes an amount of heat. In the case of hydrogen fuel cells (where hydrogen is the fuel) water is the waste byproduct. There are a variety of fuels that can be used including hydrogen, hydrocarbons and alcohol. Most current fuel cell designs use hydrogen for the fuel. For the anode and cathode, catalysts can include platinum, nickel and cobalt, but depending on the type of fuel cell a number of other materials can be used, including many that are under development. 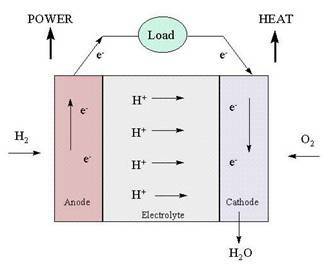 The electrolyte, which defines the fuel cell type, can be made of a number of substances, including potassium hydroxide, salt carbonates, phosphoric acid, polymers and metal oxides. The oxidant is usually oxygen (from the air), but oxidants can also include chlorine and chlorine dioxide. Micro combined heat and power (m-CHP) systems are becoming widely used for home and office energy systems. They convert fuels into heat and electricity using a variety of engines, as well as fuel cells. Quite often their primary purpose is to generate heat, which results in an excess of electricity. The excess electricity can either be stored or sold back to the grid. Because m-CHP systems can be up to 90% efficient, there has been much interest in them, particularly in Japan, Germany and the UK, where government subsidy programs exist to support growth of this industry. Fuel cells are a promising energy technology for the future and governments and industries around the world are investing in their development. The main usages envisaged are for automobiles, power plants, and home/office energy systems. However, because of a fuel cell’s ability to provide energy independence, many other applications will also become possible. Politically they offer an opportunity to reduce dependence on oil, which for the U.S. is a very powerful incentive. However, the technological hurdles to achieve this are significant and it is predicted that fuel cells will only become broadly realistic by 2020 to 2030. Until then, the pressures to reduce greenhouse gas emissions has meant that for certain fuel cell applications, e.g., the U.S. automobile industry, other more short term based technologies are taking precedent.